Most Americans would benefit from President Obama's tentative deal with Republicans for extending the Bush tax cuts, and economists largely agree it would help stimulate the economy. Yet the plan would actually slightly increase taxes for the poorest Americans, economists say -- at a time when some leaders in Washington are trying to bring attention to the nation's widening income disparity. The level of income disparity in the U.S. "is really an unacknowledged crisis in our country," Rep. Jan Schakowsky (D-Ill.) told Hotsheet. Schakowsky and other House Democrats met with Vice President Joe Biden Wednesday afternoon to talk about the tax cut deal. Several members of Congress have voiced concerns - both in that meeting and publicly - that the deal gives too much to the wealthy. Not only has the president said he would accept a two-year extension of the Bush tax cuts for the highest-earning Americans, but he has also accepted an estate tax level that will keep most estates from having to pay anything. "I don't think it's an exaggeration or hyperbole to say this gush of income to the very top wage earners and the shrinking of the middle class is a crisis," Schakowsky said. Mr. Obama's plan, which includes several components, is focused largely on sustaining the status quo -- keeping income tax rates the same by extending the Bush tax cuts for all, for example. There are a couple elements of the plan, however, that could make a significant difference to Americans in terms of what they pay in taxes. Firstly, the "Make Work Pay" credit enacted under Mr. Obama's stimulus plan would be allowed to expire, and a one-year payroll tax cut would be enacted in its place. The payroll tax, which is technically separate from income tax, funds Social Security and Medicare. The nonpartisan Tax Policy Center today published a chart comparing the impact of the "Make Work Pay" credit (which gave up to $400 per year to individuals and up to $800 for couples) to the payroll tax cut plan (which would reduce the tax by two percent). It shows that the payroll tax cut will, on average, put more money into the hands of more Americans. The more an individual makes, the larger their tax relief will be; thus, the White House has emphasized middle-income families will take home more than they would with "Make Work Pay." Obama: Tax Cuts For Wealthy GOP "Holy Grail"
Those on the bottom rung of the income ladder, however, are at a disadvantage. Individuals making under $20,000 per year or households making under $40,000 would receive more money from the "Make Work Pay" credit, since the two percent payroll tax cut would amount to less than $400 or $800. The difference amounts to just a couple hundred dollars per year -- a few dollars per week. But Schakowsky said it would have a serious impact. "A few dollars a week can mean your bus fare getting to work," she said. "A few dollars a week adds up at the end of the month toward the rent." Roberton Williams, an analyst at the Tax Policy Center, agreed. "If you're making only making $10,000 a year, you're only getting $200 a week -- and $4 out of $200 is serious money," he said. "It is a big deal if it's the difference between having lunch one day or not having lunch that day, or putting breakfast on the table for the kids." Williams said there's clear evidence that putting cash back into the hands of low-income Americans has a stimulative impact. For instance, he said, there is a huge uptick in food purchases at Walmart on the first day of every month -- when food stamp accounts are replenished. "At Midnight the last day of the month, people line up at Walmart and they go through the cash registers buying food," he said, "so they can put breakfast on the table for the kids." That kind of behavior, Williams said, shows that if you give a low-income earner a dollar, "it's going to be spent, and they'll probably spend it before they even get it." While the "Make Work Pay" may be a more efficient form of stimulus, Williams said the payroll tax cut plan would have a larger overall impact on the economy, simply because it invests twice as much money. Still, Williams noted that Mr. Obama campaigned on the platform of revising the tax code to address income disparity. "This turns that on its head," he said. Democrats concerned about income disparity have also protested the way the estate tax is fashioned in Mr. Obama's plan. Currently, there is no estate tax, but in 2009, House Democrats passed a bill to set the tax at 45 percent on estate transactions of more than $3.5 million. 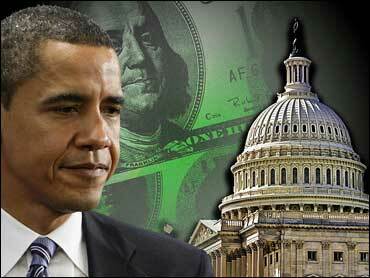 Mr. Obama's plan would set the tax at 35 percent on estate transactions of more than $5 million for the next two years. Williams said the plan is "so generous" it will only affect one in every 800 estates. Schakowsky called the estate tax "the most offensive part" of Mr. Obama's plan. "There's absolutely zero rationale for a handful of Americans benefiting as they do from this giveaway to the filthy rich," she said. Several other House Democrats, including House Speaker Nancy Pelosi, have decried the estate tax plan. Schakowsky said there is a lot of opposition to the plan among House Democrats. Rep. Jim Moran (D-Va.) described today's caucus meeting with Biden as "contentious" and said the vice president did not signal any willingness or opportunity to change the deal, CBS News Senior Political Producer Jill Jackson reports. Rep. Gerry Connolly (D-Va.) said after the meeting that he believes there will be a number of Democrats who vote against the package, Jackson reports. However, he said he thinks "there are a lot of people prepared to support this package. Perhaps holding their nose or someone else's nose."